President Donald Trump will make a cost-cutting opening budget offer Monday that will dismiss hopes for a grand budget deal and likely stoke fresh fears of another government shutdown. Trump will put on paper what the White House has already prepared lawmakers to receive — an audacious plan for sucking 5 percent from the budgets of non-military arms of the federal government, while using an accounting trick to bust beyond set spending limits for defense programs. The 5 percent would be below the fiscal 2019 budget limits for domestic agencies. Trump in his budget request also is expected to rekindle partisan feuds over the border wall, project robust economic growth above 3 percent, take longer to balance the books than Republicans have advocated in the past and pay for a new Space Force within the Air Force. Although the request is merely a messaging document, the president’s posture will contribute to apprehension about a government shutdown, some seven months before federal funding runs out again on Sept. 30. On Capitol Hill, even Republicans are saying the president will need to come to the realization that the GOP must give some ground this year to Democrats, who hold the House majority and 47 seats in the Senate. But the Trump administration wants to hold fast to its mission to slash spending. 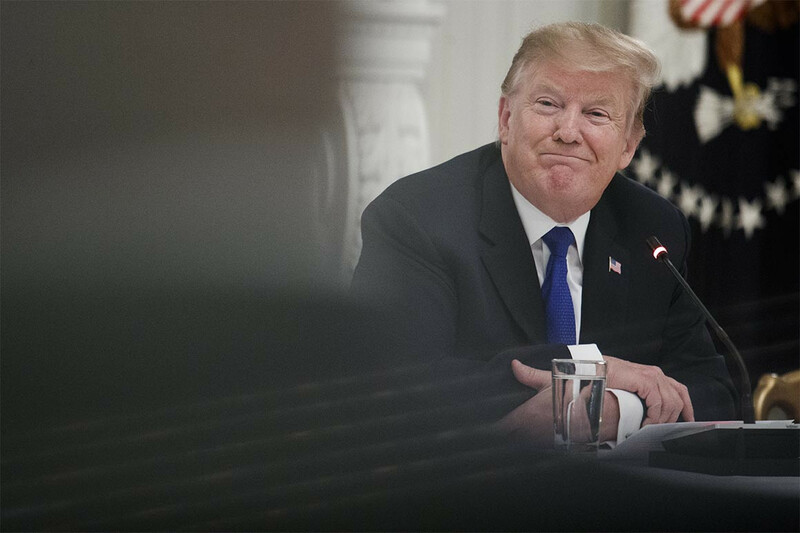 Besides 5 percent cuts below fiscal 2019 caps for non-defense programs, Trump’s budget request is expected to project economic growth of 3.2 percent this year, 3.1 percent in 2020, 3 percent in 2021 and 2.8 percent in 2026, with a 10-year forecast of 3 percent. The plan will also seek to balance the budget within 15 years, by 2034, rather than bringing spending in line with revenue over the typical 10-year period that’s been a goal for Republicans. The budget request is expected to restart partisan feuding over funding for a wall along the U.S.-Mexico border. Although the administration has not said how much money the president will propose for that project, the request is expected to be substantial enough to evoke the same kind of rebuke from congressional Democrats that led to the veto threat that spurred the 35-day shutdown that began just before Christmas last year. Through the request, Trump will seek $100 million for the Women’s Global Development and Prosperity Initiative his daughter and adviser, Ivanka, is spearheading with an aim to assist 50 million women in developing countries by 2025 through aid programs and partnerships with private businesses. The president will ask Congress to fund a new Space Force within the Air Force, a project expected to cost $72 million in fiscal 2020 with a 200-person headquarters and eventually grow to about 900 people for a cost of about $500 million a year. In the plan, the Trump administration will detail reforms to eliminate duplication and increase efficiency within federal agencies. When a president’s annual budget request arrives on Capitol Hill, lawmakers love the retort: “The president proposes, Congress disposes.” Spending leaders are already taking this year’s plan less seriously, however, than past presidents’ wish lists. Senate Appropriations Chairman Richard Shelby (R-Ala.) said last week that it would be hard for Congress to find consensus to cut non-defense programs by 5 percent, as the president seeks. “Plus, you’ve got the House, too. You’ve got a third leg of politics,” Shelby said. Congress has less than seven months to pass spending bills to fund the government in fiscal 2020, which begins on Oct. 1. An overarching deal on limits for defense and non-defense funding is the first step in that process. From there, spending leaders can divvy up limits among the 12 annual spending bills, then among each federal department, agency and program. White House budget director Russell Vought already signaled that the Trump administration may oppose any congressional deal to raise the budget caps, citing “unsustainable” levels of borrowing, in an op-ed last month. And it would not be out of the question for Trump to ultimately veto such a deal, if congressional leaders tune out his demands. House Budget Chairman John Yarmuth (D-Ky.) insists, however, that there is already bipartisan agreement on raising caps for both defense and non-defense spending. Democrats will at the very least seek to raise caps equally for non-defense programs and the military, he said, while pursuing greater investment in things like education and health care. “There is bipartisan consensus on Capitol Hill that we must raise the caps for both non-defense and defense discretionary spending levels … The Administration’s plan to delay is a total disregard for responsible governing,” Yarmuth said in a statement Saturday. The Trump administration’s renewed focus on fiscal responsibility comes after two years of ignoring a ballooning deficit and shepherding passage of a tax overhaul that contributed to a federal debt of more than $22 trillion.